I am once more having some issues with the in-laws. I am sure they don't even know because this time around I haven't said anything. Only to my husband. I am still pissed about no one calling/texting/emailing for Baby's birthday. And now to add to my thinking that Jon's family doesn't really care about Baby is the fact that we have asked his mom multiple times to come and visit Baby during the week and she hasn't. Baby one day started crying that he wanted to see mom-mom. I didn't even know what to say because before this Jon had asked her twice to come visit Baby and nothing. Well a few days later on a day that she is up here by our house cause she had work till 3pm Jon calls her and tells her how Baby had been crying for her to come see him. We were both thinking that hearing that would make her want to come see him even if its for 2 hours. Well her answer to that was "how sweet, ok I gotta go" ummmm....what in the world. Really? I flipped! Now it has been over a month from the time that Jon asked his mom to come spend some time with her grandbaby and still we have not seen her. I think I get so upset with Jon because I feel like he defends his family all the time. He tells me that I need to understand that his mom doesn't feel comfortable here at my home. Please! Excuses, excuses is all I hear. I am so sick and tired of hearing them. Just come see you precious grandbaby! 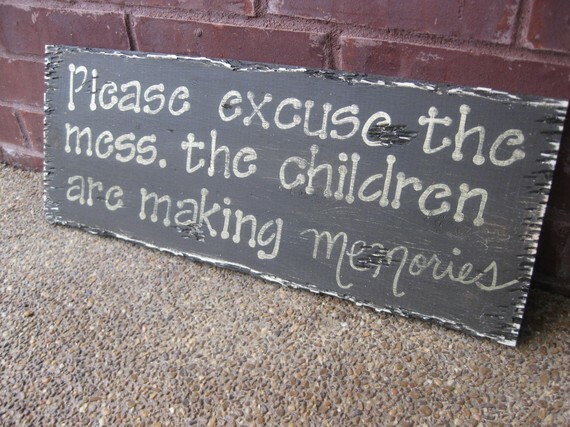 Is that too much to ask of a grandparent? Cause I didn't think. Everytime they have seen him has been because we have made the effort to go down to SLC to have them see him not once have they made an effort to come here to see him. I am really working hard on my patience. I just really don't have very much patience when it comes to anything. Not a good thing when you are a mother. 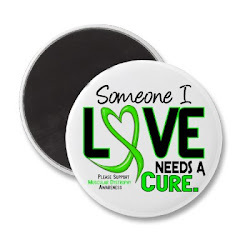 Well I decided I need the Lord's help with this cause me doing it on my own is not working out. I started waking up before Baby and am reading my scriptures and then doing a prayer asking for help throughout the day with patience. Its funny how amazed I am every single time that prayer works and I get answers. I have never had so much patience in my life. I feel like a way better mother. We took Baby to a Dinosaur park the other day since he LOVES dinosaurs. We thought this was going to be a hit for sure. I didn't know that they had dinosaur noises throughout the park and it scared him. Poor thing, I really thought he was excited when we told him about it. We were there for a while and as long as we weren't near the area where the noises were he was fine. He really liked the playground they had. He did get his first skinned knee. The sad part was that he fell on the same spot twice. He is such a little trooper though and barely cried. I took Baby to the playground they have at the mall. Yeah, that was my first mistake! The second I get there I notice there is a 5-6 year old beating up on all the children. I know I probably should have left then but that would have been complete melt down which I was not ready for. Baby plays for a while with no problems, he holds his own. Then Baby goes down the slide and the bully doesn't wait till Baby is done and he goes down and while going down kicks Baby but I told myself it was an accident. After all it did take Baby a while to get up. But then Baby goes up the stairs to get on the slide and as he gets to the top this bully grabbed him by the hand and threw him down the stairs. I ran and grabbed this boy buy the arm and told him what he did was wrong and that I saw him beating up my child and other children and that he needed to stop or leave the ground. Then I asked him who his mom was and of course he didn't tell me. All the parents around me who saw this happen were scared, I am not even lying. Later on the little boy made a little girl bleed after he kicked her in the mouth and he just walked away and then the mom run out and did nothing. Didn't say sorry, didn't even talk to the child. I was so mad. I could not believe the nerve on some people. I have become a working mom. I know there are people who will take offense to me being happy about this but people honestly this needed to happen for my mental health. I love my son more than anything in the world but doing the same thing every.single.day can start to drive you crazy. Last month we had some things happen that made me and my husband realized we needed to get our financial situation together. My husband has too much going on in his life so we realized its not fair for him to also be in charge of our finances. So I have taken over our finances. This is a really scary thing for me but I am learning. As soon as I sat down and saw what was going on I realized I needed to start working ASAP to keep us afloat. Thankfully my husband owns his own business and so I have become one of his employees. I only work 3 days a week, which is perfect for me. It gives me a little break from being mom and I get to talk to other people. The best part is I feel like I am becoming a better mom to Baby. I have more patience with him. I have also stopped worrying about how clean my house is. This is a good thing. However I try not to have people come over they might have a heart attack. I read a quote recently that I absolutely love and am totally putting it somewhere in my house where everyone can see it. 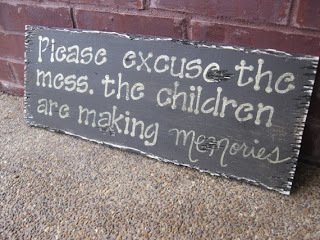 It says "Please excuse the mess the children are making memories". I couldn't have said it anymore perfect. I know that its not a good thing to be happy when someone dies but when I heard Osama bin Laden died it made me kinda happy to know that such an evil person is no longer on this earth. I put this on facebook and people were offended but oh well. I am entitled to my opinion like everyone else is. We went to church, of course by ourselves. During church in between all the craziness that is my son the ambulance was called for one lady. I did hear the lady giving a talk say to her granddaughters to please promise her that they would only marry return missionaries. I really did laugh too. Trust me people, by the way I wanna scream this out for the world to hear, just because you marry a return missionary does not guarantee that he will stay active or be a good person. This makes me so mad when I hear it. Luckily since it was Easter I was already feeling the spirit by then and didn't leave at that point. I did however enjoy Sunday School. We went down to Happy Valley, aka Utah County for dinner with Jon's family and that was fun. Baby really had a blast collecting eggs which thankfully were all left there. Sad thing is I didn't even get pictures of him I only have some from the morning at our house but oh well. One last thought...now that most of my family from Costa Rica is on facebook I get to have contact with them on the regular which is amazing but this year for Easter it made me sad because exactly 7 years ago I was in Costa Rica with my family and Easter there is the best. We have all sorts of food we eat that you cannot get here. So sad.